Last Wednesday 28th of November was the Loy Krathong festival, it is celebrated nationwide in Thailand and we joined in the festivities. Loy Krathong is a Buddhist festival celebrated in the twelfth lunar month during the full moon. This generally coincides with the end of the rainy season and the rice harvest. The festival is an opportunity for Buddhists to give thanks to the water goddess for the blessings she has bestowed, eg. good rice crops. The main part of the festival is the releasing of Krathongs into water ways, it could be canals, rivers, ponds, fountains – we even saw some in water features at apartment complexes. Even though I’m not Buddhist I like the idea of being thankful for water. Water means so much to humans, it’s an essential part of every day life. I find it difficult to imagine what life must be like in parts of the world where it’s a daily struggle to get enough water to drink let alone shower, where people have to walk long distances just to get small amounts of water. It highlights how easy we had it in New Zealand where water is an easy thing to come by and it’s second nature to turn on the kitchen tap and pour yourself a glass of water. So I’m grateful for this festival which helps remind me that not everyone has it easy, and to be grateful that I can get a drink of water everyday, I can shower and clean my dishes, even pop down to the swimming pool for a swim. Krathongs are offerings to the water goddess that float on the water and are usually decorated with flowers, banana leaves, candles and incense. The base of a traditional Krathong is made with a section of banana tree trunk but it is common now for them to be made with polystyrene, a single lotus flower or bread. 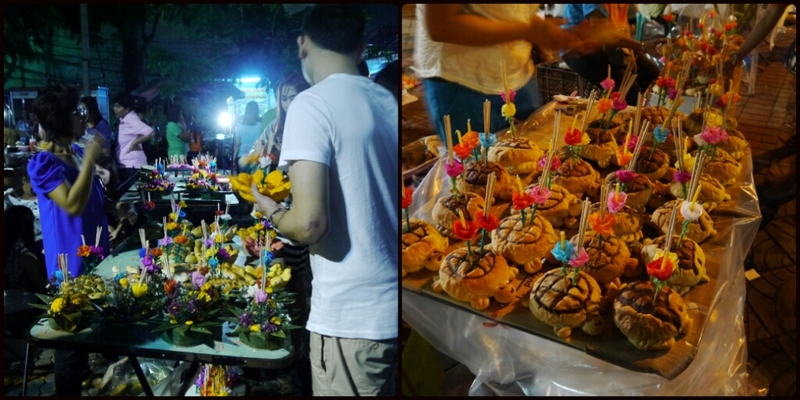 Bread Krathongs are baked into various shapes, we saw a traditional lotus shape, a turtle and even a lizard. The thai government is actually trying to encourage people to use bread – I imagine its because it decomposes quickly – though from what we saw it’s more likely because the fish eat them. The festival is generally celebrated at night, where families and groups of friends congregate near waterways and pray then release their Krathongs into the water. I was fortunate to be able to celebrate both at night and during the day. I was able to attend a celebration at a local school near our place. It was a memorable morning, a lot of the children had dressed up in traditional Thai clothes and some had bought their own Krathongs to school. The children and teachers danced around the school while tradiitonal music played, even I danced a little. For safety reasons the candles of the children’s Krathongs weren’t lit and they didn’t get to release them into the nearby fish pond. 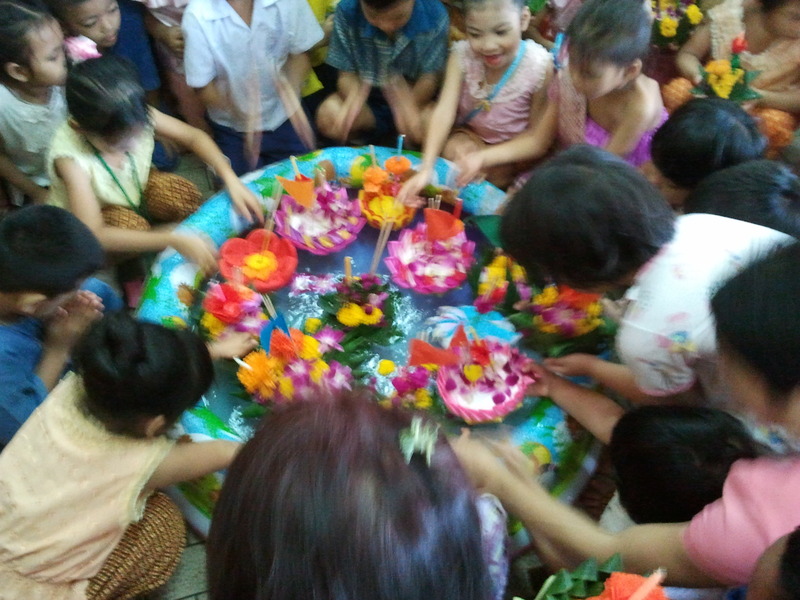 But they did use the cutest little paddling pool and as it was so small the children had to take turns releasing their Krathong. The options of where to go to celebrate this festival are endless, basically any waterway will do. 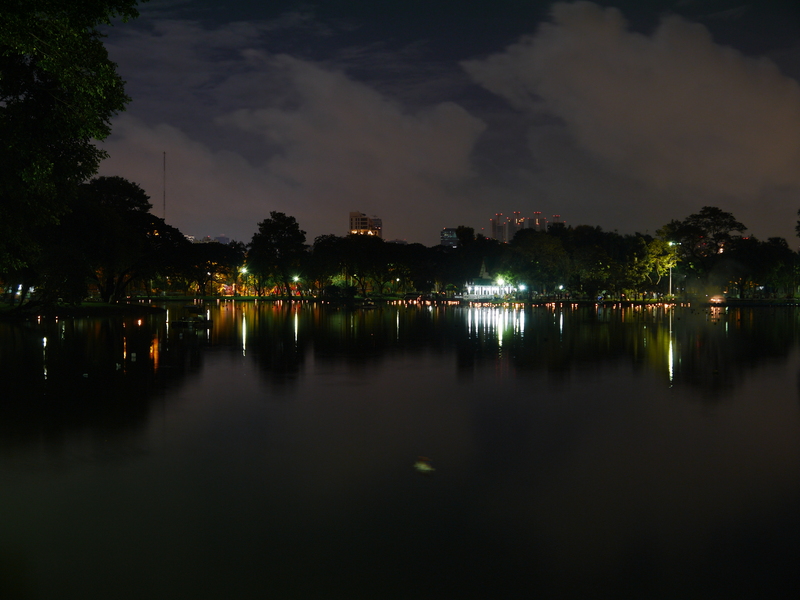 To make the most of the evening we visited two parks, Suan Santi Phap near Victory Monument and Lumphini Park near Sala Daeng BTS in Silom. We’d heard that Suan Santi Phap was a place where a lot of Thai families go to celebrate. We arrived about 6.30pm, had some dinner and headed to the park. 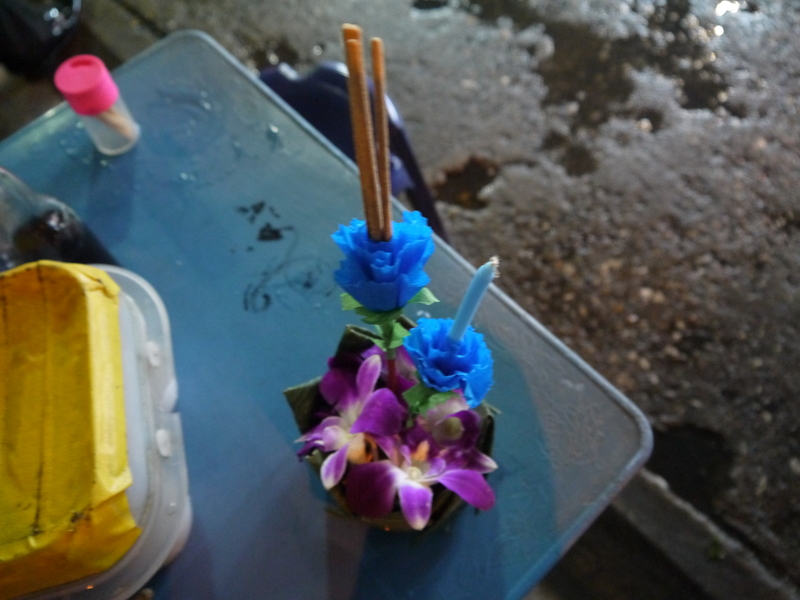 We bought our Krathong from one of the many Krathong sellers on the street surrounding the park. I’d been seeing stalls selling Krathongs all day but knew there was no rush as there would be plenty near the park. We joined the crowd heading to the pond. 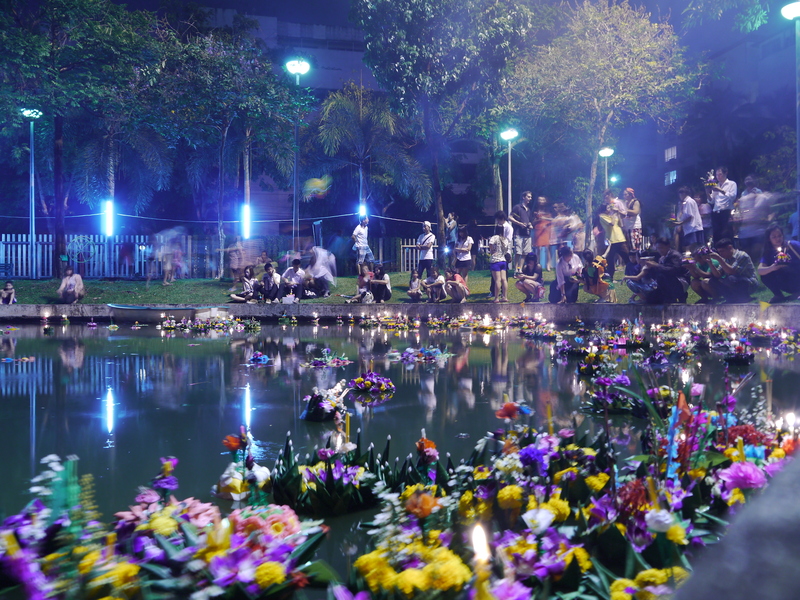 It was a beautiful sight, the pond was filling up with Krathongs with their candles lit and incense burning. We chose our spot and let our Krathong float off, not quite getting the technique right though and our Krathong ended up being a bit lopsided but the candle stayed alight and the incense burned away. I think that means we should have good luck. Lumphini park was a different experience with hundreds more people, they even had security guards around the pond – more to keep people safe as the grass had turned to mud in places. Again the sight was beautiful, even more so because there were hundreds more Krathongs. We walked around the large pond to admire the view from afar and found some Thai people watching the catfish in the pond attack a Krathong made of bread. It was a magical day and one I’ll remember for a long time. This is a great post, almost as good as being there, and here’s hoping for the ensuing good luck now that you’ve floated your Krathong. « Monday Madness: Curiosity killed the chicken?